As well as Card Counting - The Definitive Blackjack Course, this tutorial describes the concept of card counting technique. The well-known fact is that the best card counters were the MIT blackjack team, the group of students who were able to beat all casinos out of their money in 1994. And now all the secrets of how they did that are revealed in 60 Minutes to Winning Blackjack DVD tutorial. 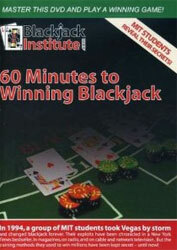 Mike Aponte, the student of MIT and the champion of World Series of Blackjack in 2004, hosts this DVD. The date of release was 2005. + practice chapters to help gamblers of all skill levels with improving their skills. What do people who watched this DVD think about it? Well, the thoughts are completely different: ones consider it to be too easy for those players who already know the basics of blackjack and card counting in particular; other ones are very excited to watch how the MIT team members play blackjack and what methods they use for winning it; the third category of people believes that 60 minutes are not enough to learn and understand card counting technique to be good enough. The story of the MIT blackjack team began in 1980's when a group of post-graduated students of Massachusetts Institute of Technology decided to use their knowledge for making money out of blackjack. Their main secrets of success were card counting and team play: in 1990's they were able to win millions of dollars and be banned out of many casinos but, anyway, continued to use a disguise for being able to play blackjack. One of the MIT team members, Ben Mezrich, had written the book Bringing Down the House which became a national bestseller and was used as a basement for such entertaining blackjack movies as 21 and The Last Casino.